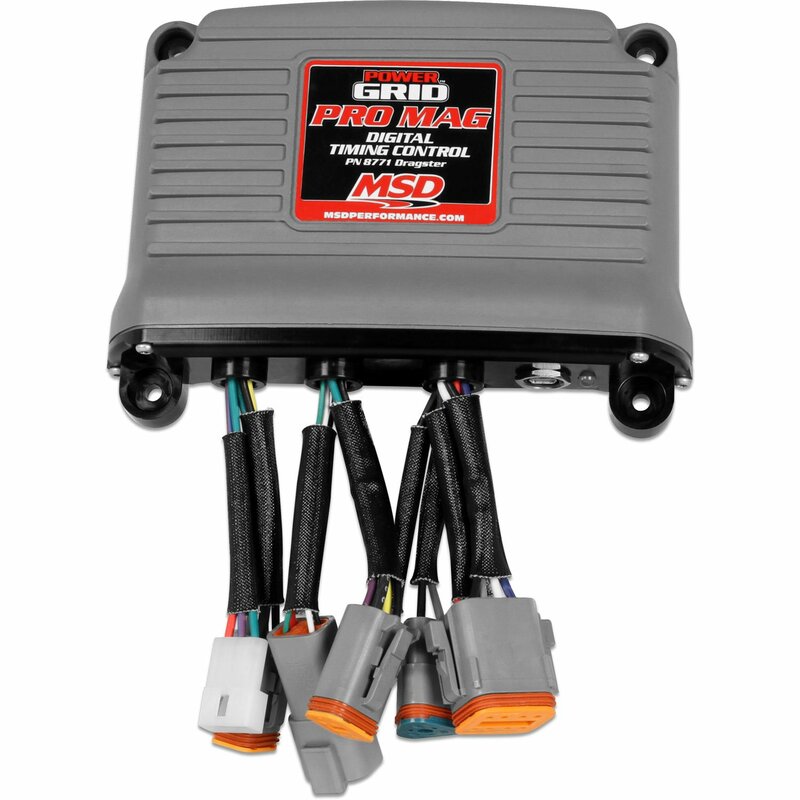 The Digital Retard Controller has a built-in speed limiter that is mandated by NHRA Specs for Top Fuel Classes. Due to the speed limiter spec, this controller is not recommended for Alcohol classes or engines revving over 8000 rpm. The Dual Channel Power Grid incorporates a high speed 32 bit microprocessor and PC software, called MSD View via a USB BluetoothTM wireless. It includes a high speed data acquisition recording engine RPM, timing, dual Tach signal, launch/WOT with sample rates of 100 samples per second or 10 milli seconds. The MSD View software will program timing curves with up to 30 points at 1.0 increments down to 0.01 second intervals. Multiple timing curves can be overlayed to choose the right one at the last minute. Other unique programs include a throttle lift timing retard, throttle inhibit timing retard and an auto pickup signal selector. This means that in the case of a crank trigger pickup failure, it will trigger the dead channel running magnetos seamlessly. The MSD View software includes a virtual dash board that can be configured to display engine RPM, Timing, Timing Retard, WOT, Timing Reset, Crank Trigger inputs and Output Triggers. Includes a CAN-Bus connection sending the recording to the RacePak data logger.